I have to admit, I bought “Inka Gold” with NO clue what it was. And used it like any other paste – which did work. But then I discovered through some research, that a little goes a LONG way! Let’s get started on day six of Go for the Gold class! The fact that beeswax comes in delicious shiny colors makes me wonder…what kind of bees are these? And can we have them make us more shiny crafty things?? In today’s lesson I’ll show you how I made a piece of Craftaboard look like metal – and how I colored a sled with Copics to look golden, too! Watch the video below, or check it out HERE in HD on YouTube! I just love the contrast between the polished shine of the beeswax and the dull snowy look of the texture paste….things that provide that kind of contrast on a card make it interesting. Along with being a unique round shape, too! On Periscope, we did a long coloring session! And in case you missed it, Kristina Werner joined in on the gold today with her lettering! And those Layering Trees from THIS popular post? Back in stock! 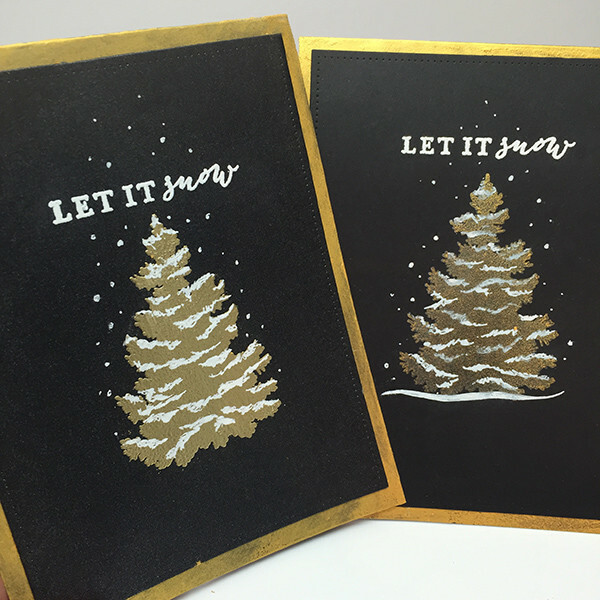 The card on the left: Shimmering cardstock stamped in white then Delicata then embossed with Stampendous gold. On the right: Licorice cardstock stamped in white then Delicata. Both card bases were rubbed with Inka Gold. We have one more day of class coming tomorrow…have you entered some student work in the Inlinkz gallery yet? I just love that little bunny! Thanks for sharing. Love these solid gold ideas! I am off to try that bonus tree card. Looks so “simple” but exquisite! Thanks again, Sandy! Great card will have to make some circle cards. Loving the videos and scopes. Tried to do some watercoloring but my stems always don’t work. They are too thick and dark. Would you show us more on creating good looking ones? Thanks for sharing. In what medium? It’s usually a lighter touch that gives you thinner lines with most mediums. 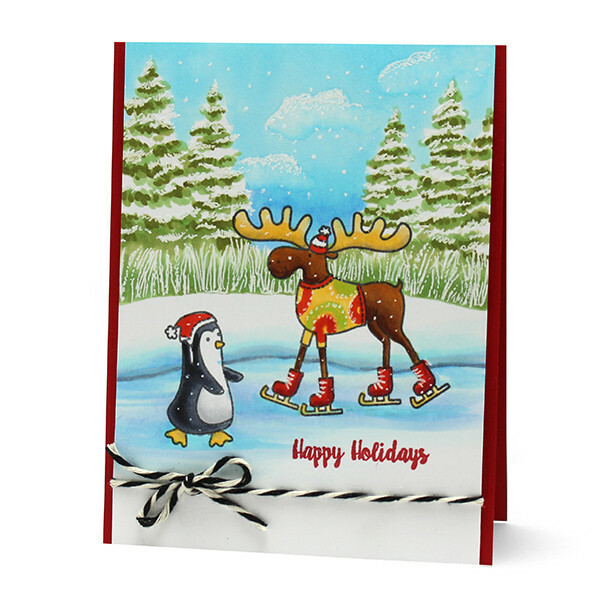 I don’t know what the favorite part of the card is…the texture background, the circle shape of the card or the copic coloring on the sleigh. Awesome! Love all these samples. I want to do that tree. I have a layered tree on it’s way now. Beautiful examples and it reminded me that I have been waiting for the layered trees stamp to come back in. Your cards are super wonderful and wish I had the products. But I am inspired and will try to work with products in gold that I do have on hand. Wonderful golden video! Love the cards, especially the eye catching circle card! Thanks for the how-to tips! Enjoyed this card also. Thanks for sharing. Another wonderful video…thank you so much for the information and inspiration!!! Love the Inca Gold! Such a great card and love your simple but stunning techniques. Never heard of Inka Gold before! Always nice to learn something new! I’ve been wanting some of the Inka Gold products…this has moved them much higher on the list! I’ve got some other similar products so I’ll give them another try for my “homework”. This has been a lot of fun Sandy, and I hate to think that tomorrow is the last day, boo-hoo. Guess I’d better get my homework uploaded! Love your card today! The black bear with the bunny is adorable. I’m definitely going to have to order some of the Inka Gold product to try out. It’s so pretty, just like your card! Such a fun card. I like that gold product and the design is so fun. I love it. Well, you have just reminded me that I have a container of Inka Gold waiting for me in my paint drawer…hope it hasn’t dried out over the summer! Lovin’ both cards… Making me feel cooler, where it’s not cool, SW FL. Gorgeous..love the round card idea!! I love, love, love your stuff. You give me so much inspiration. Adorable, and I love that you showed us how to color gold with Copics! Thanks! Your videos have been very inspiring. Thank you so much. I am really enjoying your gold class. So glad you covered Inca Gold product. Bought some and several of the jars were dried out. The product looks like it should be salvageable. Is bees wax the major ingredient of Inca Gold? If so, it probably needs something to break down the wax. Someone suggested a folded wet baby wipe left on top of the Inca Gold with the lid on, but that really didn’t work. An artist friend recommended using a product called turpenoid. I’m not sure what to do with it. Any ideas would be appreciated!!! I see Tracy weighed in…I haven’t had to revive any so I’m not sure! But I would try out a little scoop with a few different things and see what works. A little bit with water, wrap a little blob in a baby wipe, try some turpenoid. Once you figure out what to try,then you could go for the whole container. Let me know what works! Oh my, even more cuteness today. what a great card. Love the gold sled and goggles. My order from Ellen Hutson is here, including the stamp set you featured in this card. I have a very shiny weekend planned! Thanks again for a great class. I don’t want the series to end! Oh, WOW!! Neat card. Love the coloring, texture and design.